It’s Weibo Wednesday time! I didn’t pay much attention to this year’s Academy Awards, which took place on February 28, but it looks like quite a few Chinese celebs did. Here we have Li Yifeng congratulating Leonardo DiCaprio for finally winning a Best Actor award. In case you’re wondering what is going on, he’s spoofing a scene in The Revenant where Leo gets attacked by a bear. In other Hollywood news, Li Yifeng was picked as an ambassador for the superhero movie Batman v Superman: Dawn of Justice, which drops in the U.S. and in mainland China on March 25. However, I’m not entirely clear on what his being an ambassador entails. Yifeng also has two TV series — espionage drama Sparrow (麻雀) and xianxia drama Noble Aspirations (青云志) — expected to be released this year. 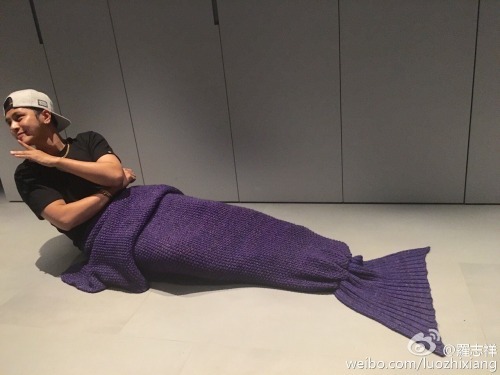 Last time, we saw Deng Chao give us his take on mermaid style; this time, we get Show Luo, who played an octopus-type character in the smash hit Stephen Chow movie The Mermaid (美人鱼). The film is playing in limited theaters outside of China, so if you’re interested, see if you can catch a showing near you. 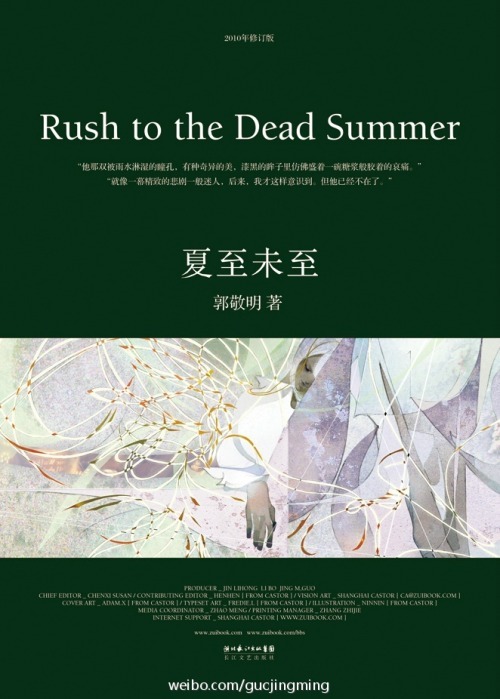 One of Guo Jingming‘s earlier novels, Rush to the Dead Summer (夏至未至), has been picked up for a TV adaptation, most likely helmed by Fated to Love You director Chen Mingzhang. Guo Jingming is known for penning the Tiny Times (小时代) trilogy and directing the film adaptations. He’s also the author of the original novels behind the upcoming Ice Fantasy (幻城) and L.O.R.D: Legend of Ravaging Dynasties (爵迹). 12 years have passed, and our previous youth has passed too. Are all of you still doing well? We can’t avoid growing up; we’ve gradually matured, gradually aged. And then a group of people, taking our place, in the form of youth, forever living in that city called Qianchuan. Do you still remember their names? Forty-year-old Peter Ho is married! He revealed that he was dating in mid-December, and he and his wife Peggy registered their marriage on March 9 — the same day Peter’s parents got married. The two had reportedly been dating for 8 years. Peter’s next project involves teaming up with Tao (aka Huang Zitao) for an old Shanghai film called Rules of the Game (遊戲規則), which is to be directed by Gao Xixi. It looks like it’s meant to be an adaptation of the drama Shanghai Bund, which Gao Xixi directed, but from a different character’s perspective. It’s not popular to show off wedding rings anymore. It’s better to show off the wedding bracelets that my beloved wife designed herself. On today’s date next year, it will be my parents’ 50th anniversary, as well as my first anniversary. Edko Films announced that Tang Wei and her husband, South Korean director Kim Taeyong, are expecting a child sometime this year. The painting you see was done by Tang Wei’s father. Congratulations to the parents-to-be! Congratulations to Tang Wei for meeting him/her. 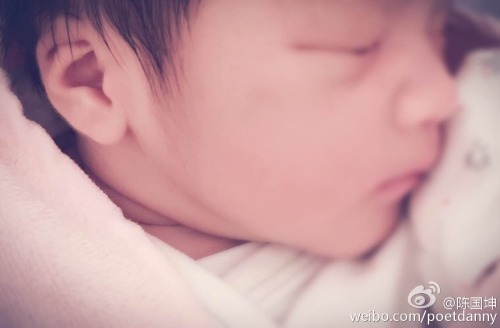 We don’t post much about him, but Hong Kong actor Danny Chan and Cantopop singer Emme Wong welcomed their firstborn child into the world on March 1. Danny is mostly known for his resemblance to martial arts legend Bruce Lee and portrayed him in the drama The Legend of Bruce Lee (李小龙传奇) and the recent movie Ip Man 3 (叶问3). Danny and Emme’s son is named Chen Zhen, which is the name of a famous fictional martial artist who has been portrayed by Bruce Lee, Jet Li, Donnie Yen, and others. 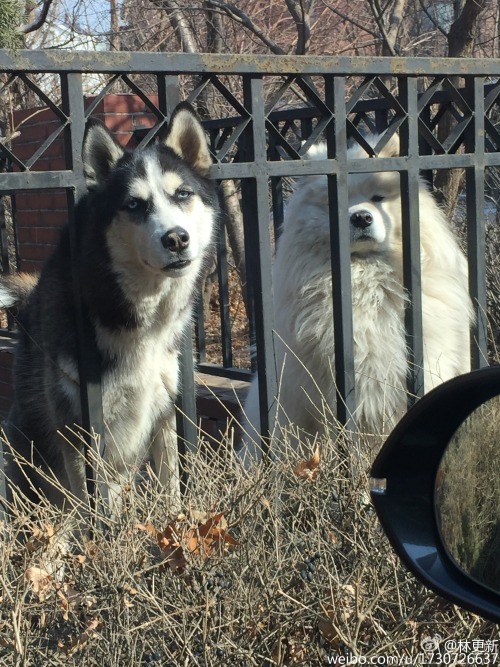 In this roundup’s random Weibo news, Lin Gengxin posted a photo of his neighbor’s two dogs, commenting on their foolish but cute expressions. Who knew that the dogs’ owner would chance upon the post and respond, “Turns out we’re neighbors!”? LOL. There’s pretty much no chance you’ll become neighbors with Lin Gengxin, but you can always check him out in the drama God of War: Zhao Zilong (武神赵子龙), which will begin airing on April 3. You can watch it English subbed at Viki. 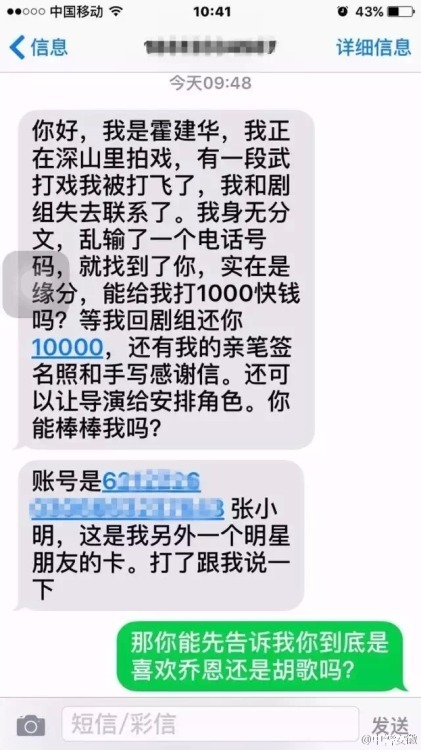 And if you didn’t think that was random enough, the police department of the Anhui Province posted a truly mind-boggling exchange between a citizen and a scam artist. Said scammer attempted to pose as actor Wallace Huo, claiming that he’d been filming deep in the mountains when a hit during one of the fights caused him to fly off and lose contact with the crew. 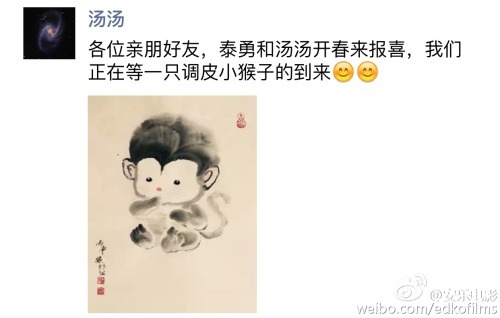 “Wallace” then asked for 1000 RMB, adding that the crew would compensate 10,000 RMB after his return, along with an autograph, a personally written letter of thanks, and a role in an upcoming drama or movie. 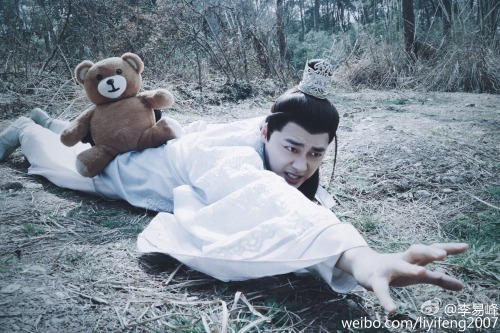 This entry was posted in Miscellaneous and tagged Chen Zhen, Danny Chan, Emme Wong, Guo Jingming, Huang Zitao, Kim Taeyong, Li Yifeng, Lin Gengxin, Peter Ho, Rules of the Game, Rush to the Dead Summer, Show Luo, Tang Wei, The Mermaid, Wallace Huo, Weibo Wednesday by Jo. Bookmark the permalink. I don’t know what Guo Jingming’s thinking…. He’s going to be slammed for the series if it succeeds. It’s basically a not-so-masked attempt to fans to clear his name of plagiarism. LOL that last one – best response ever. Oh. My. That last one XD.